MakeMyTrip Ltd’s market capitalization is higher than the market capitalization of Jet Airways (India) Ltd and Kingfisher Airlines Ltd, a fact that could mean nothing, indicate the sorry debt-laden state of the two airlines, be nothing more than one of those market aberrations, or indicate the coming of age of dot-coms in this country. This analyst’s belief is that it is the second. Kingfisher Airlines’ auditor said in the company’s latest annual report that the firm needs to infuse required funds to continue as a going concern. It added that the company’s accumulated losses were more than 50% of its net worth. Things may not be as bad at Jet Airways, but they’re not much better either, what with the company’s many attempts to raise equity capital also coming to a naught. With no signs of an improvement in their financial position, valuations of these two companies have crash-landed this year, falling by more than 60% each. Things have turned so bad on the valuation front that the cumulative market capitalization of the two companies now stands at only ₹ 3,620 crore, or close to $760 million. For perspective, the market cap of online travel booking firm MakeMyTrip is higher at $834 million, based on the share price at 8.30pm IST on the Nasdaq. 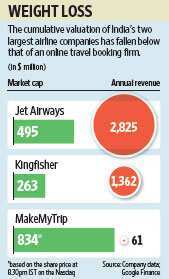 MakeMyTrip gets about three-fourths of its net revenue from its airline ticket booking services. Jet Airways and Kingfisher Airlines are the two largest airlines in the domestic market, with a cumulative market share of over 45%. And while MakeMyTrip is the market leader in the online travel booking space, its share of customers among all flying passengers in the domestic market is only 11.5%. In other words, it’s not that MakeMyTrip enjoys a monopoly position in its sector to command a high valuation. On the contrary, Jet and Kingfisher’s valuations have fallen to pitifully low levels, so much so that their cumulative valuation has fallen below that of one the many ancillary companies that service them. This is surely a rare case where an ancillary firm is valued higher than the very companies it owes its existence to. As absurd as this situation looks, it seems unlikely that it will change in a hurry. Apart from battling industry-wide problems such as high crude prices, both airline companies have their own issues in the form of high debt, a relatively higher cost structure and the burden of managing acquisitions of bleeding airline companies. Investors’ decision to avoid these airlines’ stocks does look like a wise one.